Tehillim, with the Metzudat David and Metzudat Tzion commentaries, and Maamadot. 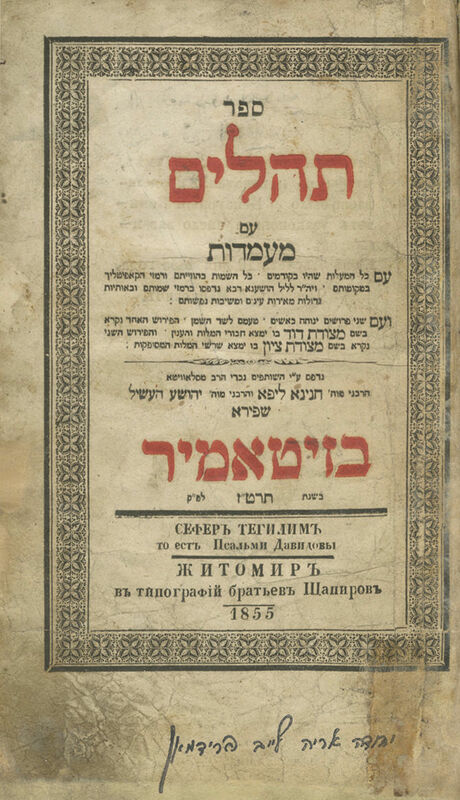 Zhitomir: R. Chanina Lipa and R. Yehoshua Heshel Shapira, grandsons of the rabbi of Slavita, 1855. Title page printed in red and black. , 172 leaves. 20 cm. Fair condition. Stains. Dark stains and traces of past dampness to some leaves. Wear and distinct signs of use to most leaves. Light worming to first leaves. Tears and damage to margins of title page and to second leaf, slightly affecting border, repaired with paper. Damage and tears to a few other leaves, slightly affecting text, repaired. Stamps. New leather binding. This edition is bibliographically unknown.